I’m sorry to tell you that the answer – as gross as it may initially seem – is almost certainly ‘yes’ – If you were in the situation where you really needed one. Faecal microbiota transplant (FMT) is a technique where treated stool from one human is transplanted into another human. In this fascinating article published by some of my colleagues, FMT was shown to be effective in treating recurrent Clostridium difficile-associated diarrhoea in a South African setting. The first line of treatment for this condition is usually antibiotics, but the diarrhoea often recurs and there comes a point when antibiotics just don’t work anymore. Basically, what the transplant does is that it replenishes ‘normal flora’ in the gut. Clostridium difficile-associated diarrhoea is most often found in people who have had major surgery and been in hospital for a long time. It’s what we call a ‘hospital-acquired infection’. In these people, routine antibiotics disrupt their gut flora, and this results in terrible (and I really mean it’s absolutely awful) diarrhoea. I am told that this diarrhoea is so bad that patients will do just about anything to get rid of it. This includes letting a doctor squirt liquidised stool – from another person – into their stomach through a nasogastric tube. The stool donor can be pretty much anyone you know (or don’t know, some countries do have stool banks), provided they are healthy and after they have had a panel of basic medical tests to make sure that they will be suitable. 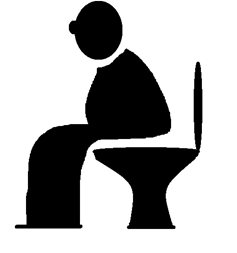 On the night before donation, the donor takes a laxative (for stage fright) and produces a sample the following day. The sample is liquidised with saline, and the resulting suspension is strained to remove particulates. About 30 – 50 mls of the strained solution is then transplanted into the patient. 4 weeks after the transplant, at follow-up, all patients in the South African study stated that their diarrhoea was gone, and that they had not had any recurrence of symptoms. The thing I like about this type of transplant is that the donor matter – human stool in this case – is a VERY readily available resource. It’s not at all like solid organ transplantation (my usual field) where hearts, livers, kidneys and lungs are extremely scarce and as a consequence there are many patient deaths. I also think that this really points us in a new direction when it comes to treating infections. Antibiotic stewardship is a catch-phrase of the moment, and antimicrobial resistance is emerging as an extremely serious challenge facing 21st century medicine. We do need to start investigating how to manage conditions without the use of antibiotics where possible, and this type of approach could be a good step in the right direction to treating some infections.